Sooty mangabeys are a variety of Old World monkey that can be infected by HIV’s cousin SIV, but do not get AIDS. Emory immunologist and Georgia Research Alliance Eminent Scholar Guido Silvestri, MD, has been a strong advocate for examining non-human primates such as the sooty mangabey, which manage to handle SIV infection without crippling their immune systems. Silvestri is division chief of microbiology and immunology at Yerkes National Primate Research Center. A recent paper in the Journal of Clinical Investigation reveals that sooty mangabeys have T cells that perform the same functions as those targeted by SIV and HIV, but have different clothing. Silvestri and James Else, the animal resources division chief at Yerkes, are co-authors on the paper, while Donald Sodora at Seattle Biomedical Research Institute is senior author. One main target for SIV and HIV is the group of T cells with the molecule CD4 on their surfaces. These are the “helper” T cells that keep the immune system humming. Doctors treating people with HIV infections tend to keep an eye on their CD4 T cell counts. 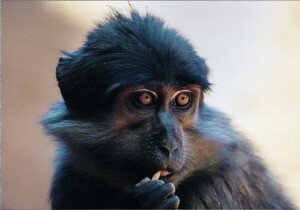 In the paper, the scientists show that sooty mangabeys infected with SIV lose their CD4 T cells, without losing the ability to regulate their immune systems.Â What’s remarkable here is that sooty mangabeys appear to have “double negative” or DN T cells that can perform the same functions as those lost to SIV infection, even though they don’t have CD4. CD4 isn’t just decoration for T cells. It’s a part of how they recognize bits of host or pathogen protein in the context of MHC class II (the molecule that “presents” the bits on the outside of target cells). Somehow, the T cells in sooty mangabeys have a way to get around this requirement and still regulate the immune system competently. How they do this is the topic of ongoing research. It will be important to assess DN T cells in HIV-infected patients, particularly to determine whether these cells are preserved and functional in long-term nonprogressors. These efforts may lead to future immune therapies or vaccine modalities designed to modulate DN T cell function. Indeed, the main lesson we have learned to date from this cohort of SIV-infected CD4-low mangabeys may be that managing immune activation and bolstering the function of nontarget T cells through better vaccines and therapeutics has the potential to contribute to preserved immune function and a nonprogressive outcome in HIV infection even when CD4+ T cell levels become low.